What a card: This is the 15th rookie card in the 1985 Topps Update set. 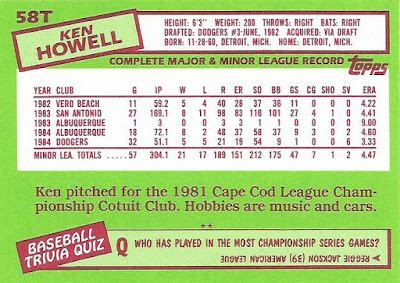 Ken Howell emerged as one of the top back-end bullpen guys for the Dodgers in 1985, appearing in 56 games and saving 12. My observation on the front: Howell doesn't seem to be feeling this photo session. What pitcher holds his glove like that? Get it up high, Howell! 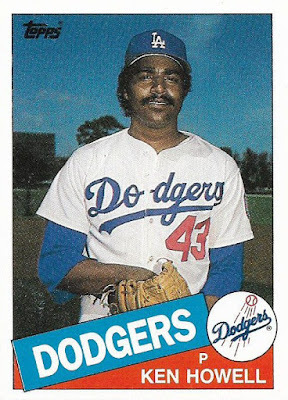 More opinion from me: The Howell-Niedenfuer days of the Dodgers bullpen came down to "which one is going to blow it this time?" Although after this past season, I might be willing to take my chances with the '85 pair. 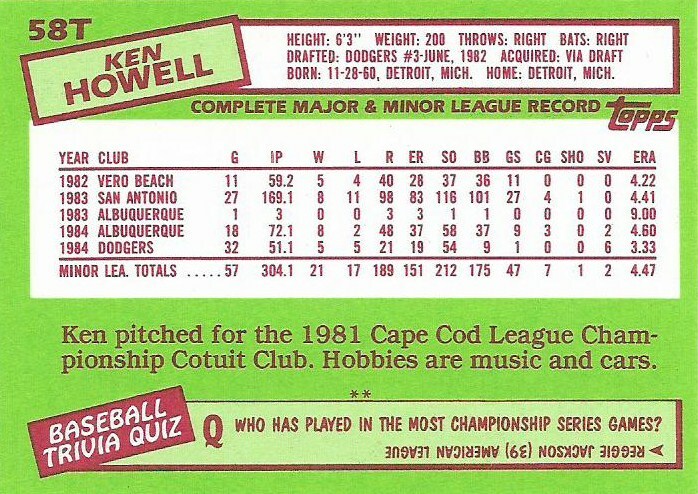 Something you might know: Howell was a fireballing reliever for the Dodgers who had control issues. He ended up as a starter for the Phillies, but injury problems shortened his career. Something you might not know: Howell has been hospitalized several times due to various diabetes-related conditions. He worked as an assistant pitching coach and bullpen coach for the Dodgers until 2015 when he was unable to report to spring training due to continuing health problems. (EDIT: Howell died at age 57, two days after this post was published). My observation on the back: My guess is that several players have surpasses Reggie Jackson in the number of Championship Series games. But LCS stats aren't the easiest to find. Derek Jeter played in 54 ALCS games. Jorge Posada played in 49.